Pakistan's controversial presidential election can go ahead as planned on Saturday, but the legality of President Musharraf's bid is still in doubt. The Supreme Court says that no winner can be announced until it decides if he can be elected while still army chief. The court wants more time to consider challenges by rival candidates. Gen Musharraf has now signed a law dropping corruption charges against ex-PM Benazir Bhutto - a crucial step towards an expected power-sharing deal. President Musharraf hopes the reconciliation agreement, as it is called, will add credibility to his government. Ms Bhutto's Pakistan People's Party (PPP) is the largest in the country. Pakistan has been engulfed in political upheaval in recent months, at the same time as the security forces have suffered a series of blows from pro-Taleban militants opposed to Gen Musharraf's support for the US-led "war on terror". 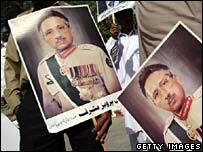 Gen Musharraf will step down as army chief, but only if he wins the election, his lawyers have said. Friday's ruling by the Supreme Court throws the presidential election into confusion. Last week it dismissed a number of earlier objections filed by Gen Musharraf's opponents on technical grounds. That led to fresh petitions being filed this week. President Musharraf is expected to be able to easily muster a majority in the national parliament and four provincial assemblies that select the president. But the court ruling means that even if he gets most votes, he cannot be declared winner until the court has decided if he was a valid candidate in the first place. "The bench has unanimously resolved and directed that the election process should proceed as per the schedule announced by the chief election commissioner," chief judge Javed Iqbal said, the AFP news agency reports. "But final notification of the returning candidate will not be issued until the decision of this petition for which the process is to begin from 17 October." That date coincides with the end of the Eid festival. 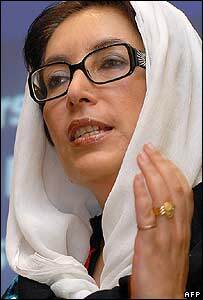 It also coincides with the day that Benazir Bhutto says she will return from years of self-imposed exile. Correspondents say Gen Musharraf was waiting for the court's verdict before formalising a power sharing deal with Ms Bhutto. The ordinance signed into law on Friday exempts any person charged with - but not convicted of - corruption between 3 January 1986 and 12 October 1999. Correspondents say it is designed to exclude another former Prime Minister, Nawaz Sharif, whose corruption cases date from 2000. The amnesty paves the way for Ms Bhutto's return to contest parliamentary elections scheduled to be held by mid-January. PPP presidential candidate Makhdoom Amin Fahim said the party had still to receive a copy of the ordinance - "so we don't know if the proposals we wanted have been incorporated". On the subject of Mr Sharif's exclusion, he told the BBC: "We want all people accused to be pardoned, we believe in a general amnesty."